dated 9 OCT 09 on KE7 6c (SG.61). A/29 JA 08 on KE7 3c (SG.61). (SG Z.40) on Mauritius "13 CENTS" on QV 3d orange-red CC wmk, some soiling. (SG.Z10) on QV 9d dull purple No wmk, str. edge at left. (SG.Z50) on QV 17c rose CA wmk. (SG Z25) on Mauritius QV 10d maroon CC wmk, corner perf. fault. (SG.Z20) on Mauritius QV 4d rose CC wmk, some toning. arrival dated 3 NOV 0(5?) on KE7 4c (SG.50). A/23 MY 10 on KE7 6c (SG.62). 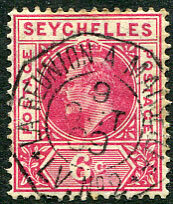 (SG.Z 20) on Mauritius QV 4d rose. (SG.Z 23) on Mauritius QV 6d blue-green, corner perf. fault lower left. 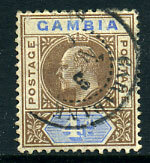 (SG.Z 16) on Mauritius QV 2d pale blue CC wmk. C/OC 14 18 on KGV 6c (SG.85). rare "B" code JA 4 29 on KGV 3c (SG.99), corner perf. fault. 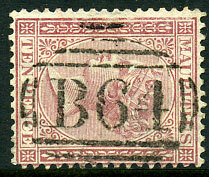 on Mauritius 1880 QV 17c rose CC wmk (SG.Z50). 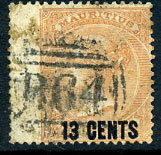 on Mauritius QV 10d maroon (SG.Z25).